Wow! Although I knew water was very precious in your area I had no idea of how it helped to form political and cultural boundaries. It certainly makes sense given it is the most revered resource. This was really interesting. Thanks. As a professional ecologist, I thought you would enjoy the existence of the acequia and the institutions that have formed around it. Very interesting post! I wish we now had the same reverence for water. (Thinking especially of the ancient canals made by the Hohokam across Arizona, many of the original sites of which are still in use, yet seeing the tremendous waste of water now for artificial lakes and lush green golf courses in the desert.) Seems a reminder that we would be best served to consider some of the natural wisdom of those who lived here in the past. I wish we did have the same reverence. I also thought of the Hohokam. Natural wisdom — we need more of it. At the edge of Dixon, we walked along the overgrown acequia from the road as it flows in a thin channel past the vineyard, the walls of houses, thru the bottoms of old cottonwood and willow to the Embudo River. It was September and the apples were ripe. The neighboring orchards having lost control and the trees spread wild and untended along this precious course of life giving water. The branches so heavy they lay down in the grass and let the apples go to the deer or to rot. We picked them, filled out pockets, our shirts, or our mouths when we weren’t laughing in delight. Thank you for eliciting the memory, the scent, the taste, the treasure of water in that dry land. Wrensong: What a jewel of a comment you have written! Really fine composition. Thank you, Jack. When I was working in the gallery on Canyon Road, the owner of the building was a woman named Alice who had lived in the home behind the gallery many years. 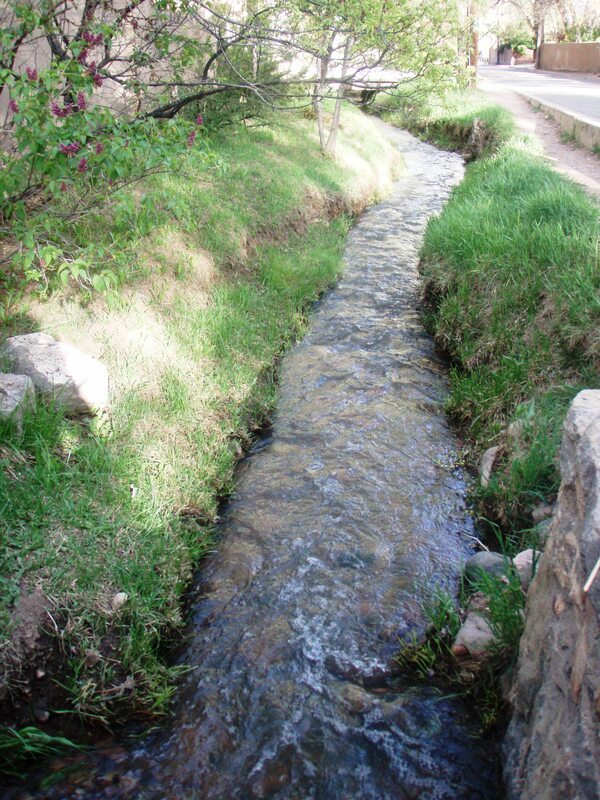 She had a beautiful garden, flowers and vegetables, and she used the acequia to water it. I miss her. She baked yummy goodies from her peach tree and was the epitome of grace. Thanks for eliciting such a nice memory. Teresa: You had such fine experiences in Santa Fe. You ate fruit watered by the Acequia Madre of Santa Fe. Alice was a special woman. I’m sorry you miss her. I wish I could have met her. I have to echo what Bill commented above. We turn on the tap. The water flows. All that culture and history cascading downward….Super post, Jack!